This pdf is 7 pages long, 1 page front cover, 1 page editorial, 1 page SRD and 1 page advertisement, leaving us with 3 pages of content, so let’s take a look! Kicking off with a nice, short paragraph of introductory fluff in the high quality we’ve come to expect from Rite Publishing, we are introduced to the oracle-themed magical items – kicking off with otherworldly disfavor, an armor/shield quality that allows the wearer to 1/day use a spells/he has access to that has the curse-descriptor to inflict it as a reaction to being successfully damaged in melee – one a successful save the ability use is conserved and since the quality is powered by the oracle’s spell allotment, the quality actually scales with the curse-spells the oracle acquires. Nice scaling-method! The Mystical Favor weapon special quality allows the oracle to exchange the enchanted weapon 1/day for a spiritual weapon, whereas the Amulet of Enigmatic Alacrity comes in 3 versions and allows the oracle to activate revelations with activation times of less than a round as a a swift action a limited amount of times per day – nice, also to see the different power levels. The Gloves of the Sin-Eater allow oracles to expel possessing spirits and break curses via cha/oracle-level checks and aasimar oracles of the purifier archetype benefit even more from their use – something I really love Rite Publishing doing here – support for archetypes. I often wonder why there’s not more archetype support out (instead of creating x ones that do similar things…) there and this is a step in the right direction. Good to see the notion used via feats etc. expanded further. Rings of Revelation’s Eyes also come in 3 versions and oh boy, touch spells get nasty, as these rings expand their range to a limited, yet significant range and allow oracles to use their spellcasting ability modifier as an insight bonus to touch attacks – this would be completely and utterly op, were it not balanced via X/day formulas that render it a powerful, yet cool choice to have. Sandals of the Oracle allow for the retrospective addition of a dodge-bonus to their AC and for additional 5-foot-steps (again, in 3 versions of different strengths). The Seer’s Lenses enhances or gives access to the seer archetypes gift of prophecy revelation or enhances it – cool item. Finally, we have the Vestment of the Divine Prophet, in 3 iterations, which grants resistance against ALL energy types – but no AC/DR. Interesting concept and surely a nice robe. Editing and formatting are top-notch, I didn’t notice any glitches. Layout adheres to RiP’s 2-column full color standard and the pdf comes fully bookmarked – cool to see, as it makes navigation, even in such a short pdf, easier. 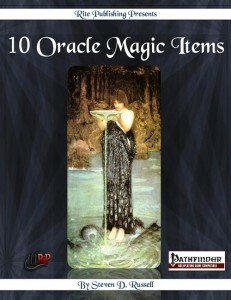 What can I say, I liked all of the items in this pdf, none struck me as unbalancing or too weak – they all have something going for them and the support for the archetypes and fact that you actually get, with the variants, much more than the advertised 10 items means that this is a great buy for a low and fair price-point. While not reinventing the wheel, it doesn’t have to and can be, in the end, considered a more than solid, nice pdf that deserves a final verdict of 5 stars and my wholehearted recommendation. Check out these items here!